Mosh is only eight months old, and already she has had a lot of bad luck. Her owners first found her hiding in their shed where she was suffering with a terrible eye injury and infection. We don't know what happened to her eye, but it was probably the result of a fight. However it happened, she needed veterinary care, so off to the vet they went only to learn that the eye would need to be surgically removed. While Mosh had some bad luck in losing an eye so early in life, she certainly had some good luck in that she found some very nice people who not only cared for her, but adopted her as their own as well. 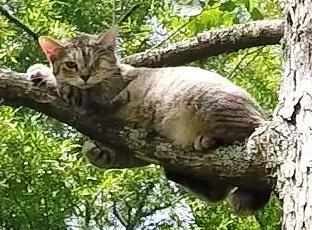 Her bad luck continued, however, when she got stuck 40 feet high in a tallow tree with an injured front leg. When she stood, she held that leg up presumably because it was painful to put weight on it. When she was resting, she would let that leg dangle below. When I got the call about her and heard her story, I wanted to go there as soon as I could so that there would be enough time left in the day to get her to the vet, if needed. When I arrived at the site, I found her resting in a fork 40 feet high in a tallow tree on a fence line. She was not happy, and she was letting the world know about it with her regular crying. The base of the tree was mostly surrounded by bamboo, so, with the property owner's permission, I cleared some of the bamboo to make room to access the tree. While I set my climbing rope, I learned more about Mosh in order to predict how she would react to me. What I learned was very reassuring. Mosh was unafraid of people and would greet strangers in her home with curiosity. Not only that, but she also had no fear of carriers. All of that was just what I wanted to hear, so I was expecting a cooperative kitty. I was not disappointed. The rescue went very quickly because Mosh was most cooperative. She even climbed down a few feet to a lower branch. She cried constantly for a speedy end to her plight. When I reached her, she had no fear of me and let me pet her. All I had to do was decide the best way to rescue her. Normally, with a friendly cat like this, I would open up the big rescue bag, pick her up and drop her gently into it. This time, however, I was concerned about her dropping into the bag while landing on her front legs. I was also concerned about how I have to hold the front legs while I place her in the bag. I did not want to risk causing her pain and possibly losing control of her in the process. So I decided it would be best to let her walk in her own way into a carrier. Since Mosh was so anxious to get down and unafraid of carriers, I thought she might not need an incentive to walk into one. Normally, I open a can of food, let the cat have a few bites, and the put the food in the back of the carrier to give them a good reason to walk into it. Mosh did not need that. She was uncomfortable and tired of standing and resting on small branches. She wanted a place to spread out comfortably, so when she saw the open carrier with a large flat floor, she wanted it and went for it. She walked easily all the way in just as perfectly as I could wish. I didn't even have to push her tail in to close the door. After she was in the carrier, she stopped crying and was completely silent. I brought her down, and we took her home to be released inside. Mosh walked around the house just fine without any limp or sign of pain in her leg. One of the first things she did was go to her litter box. 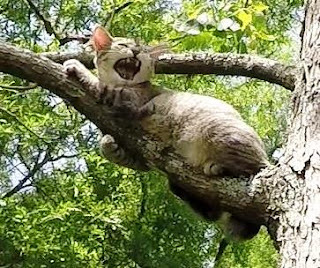 Cats do not like to pee in the tree, so they will hold it as long as they possibly can. Mosh had been in the tree only one night, so she held it all that time and was ready to let it go. After that, she was ready to eat. As she ate, her brother cat, Xavy, greeted her and sniffed her intently, even giving her a few licks on the ear and head. Mosh's leg continued to look fine, so hopefully she will be alright. She is looking and acting normal as if nothing ever happened, and her owners are happy to have her back home safe and sound. Hopefully, her run of bad luck is over, and, hopefully, she won't be climbing any more trees. But if she does. I will be very happy to rescue her again.